I am continually creating classes from JSON. In the past I have used json2csharp.com to accomplish this task. It is a very simply website with one large textbox. 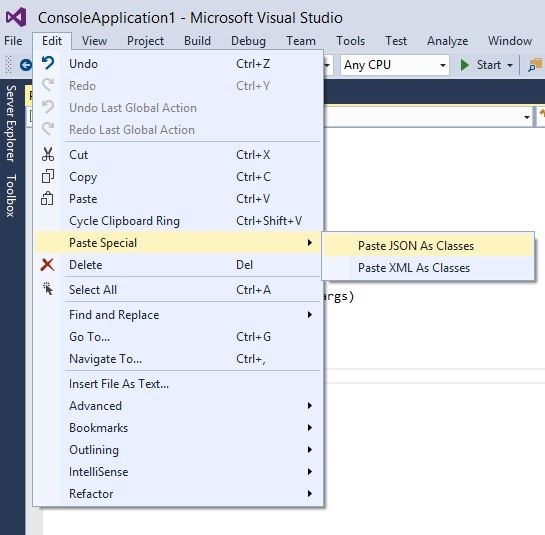 Paste your text or a link to text and click the generate button and suddenly you have C# classes! Open a file. If you want to paste JSON the file must be a class file (have the .cs extension). It will generate as many classes as are needed. I’ll give a few examples to see the benefits of this new feature and how it could be improved. 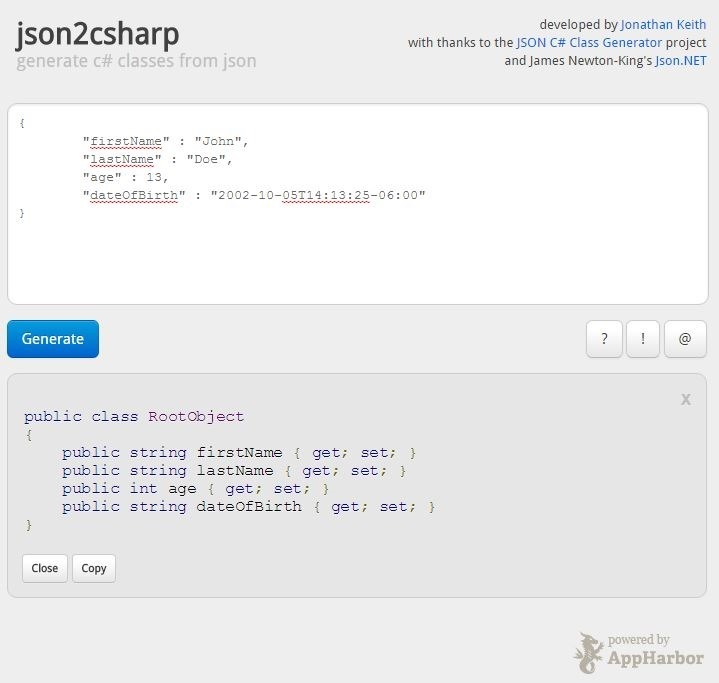 You’ll notice that the properties are in lower camel case to match the property names of the JSON. Notice that the age property is correctly of type int and that the dateOfBirth property is of type DateTime. json2csharp.com would turn this property into a string. However, the dateOfBirth property in JSON format included an offset from UTC so the property should have been of type DateTimeOffset to ensure that it is properly de-serialized. What if you have multiple classes that need to be de-serialized? Each class will be generated. Notice that it made a Friend array rather than using the preferred (in my opinion) IEnumerable<Friend>. This is primarily because some JSON converters need a concrete class to de-serialize to. Serializers like JSON.Net allow you to specify an interface and it will default to using a concrete class. So if you specify IEnumerable<T> JSON.Net will create a new List<T>. 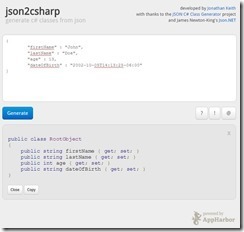 One of the biggest problems with json2csharp.com is it’s ability to “reuse” a class. This problem is present within the new Visual Studio feature as well. Take the following example of providing paging links in a result. The resulting class generation is to create a class for “previous” and for “next”. It would be great if it would “reuse” the first class it created rather than creating a new one. Deleting the extra classes can become quote a pain when you have some json that returns say 10 or more links to other information as well. Side note: If anyone knows if I can help contribute to this tool please let me know! Another area for improvement is to say you want to default to using a particular JSON serializer so that it could capitalize property names. For example, if I could specify that I wanted to use JSON.Net then it would capitalize the classes and add the JsonPropertyAttribute for proper serializing and de-serializing.